The 32nd Annual Olmsted Falls High School PTA Talent Show is set for TONIGHT, Friday, February 1, 2019 at 7 pm in the Olmsted Falls High School Auditorium. Join us for a fun-filled evening featuring acts ranging in age from Kindergarten through 12th Grade demonstrating their musical, instrumental, vocal and dance skills. Please come and support these amazingly talented students. Tickets are $5, adults; $3, students. All proceeds will benefit the OFHS scholarship fund benefiting graduating Seniors of the Class of 2019. Tickets are available at the door. Come warm yourself up with a free cup of hot chocolate or coffee, and some awesome entertainment! Tonight is the BTC’s 4th annual Monologue Showcase! Table service begins at 6:45pm, and the show begins at 7pm in the OFMS Cafeteria! The Olmsted Falls Music Association will present the annual Ballroom Blitz TOMORROW, Saturday, February 2nd. $10 per person / $7 for students & seniors (65+). Dancing, light refreshments, raffles, door prizes and more – including a chance to win a 43″ television!! Definitely a night you won’t want to miss! Thank you for supporting OFMA & this fundraiser! Mark your calendars to attend a free presentation for parents and guardians ONLY hosted by Olmsted Falls PTA Thursday, February 7th at 6:30 p.m. at Olmsted Falls Middle School. The Ohio Internet Crimes Against Children Task Force will present “Is It Worth The Risk?” – a free presentation geared towards educating parents and guardians of today’s internet connected youth about the dangers of the internet, mobile apps, sharing personal information, and online interactions. The task force will provide parents with the tools and knowledge to protect themselves and their children. Did You Know? OFCS Superintendent Dr. Jim Lloyd authors a blog providing insights on exciting things happening in the district, as well as updates regarding what our district is facing in the broader field of education. It is simply one more way for families and residents to better understand what is happening in our schools and how the Olmsted Falls City School District impacts our students and community. To read Dr. Lloyd’s latest post to the OFCS Superintendent’s Update, please click HERE. KINDERGARTEN REGISTRATION FOR 2019-2020 NOW OPEN! Did You Know? Kindergarten Registration for the 2019-2020 school year is officially open! The first step to enrolling a new kindergarten is completing the online registration. Please click HERE to access the link. We look forward to welcoming a new class of Itty Bitty Bulldogs in the upcoming 2019-2019 school year! Olmsted Falls and Midview came together to create a great kick off to Celebrating Differences Week. 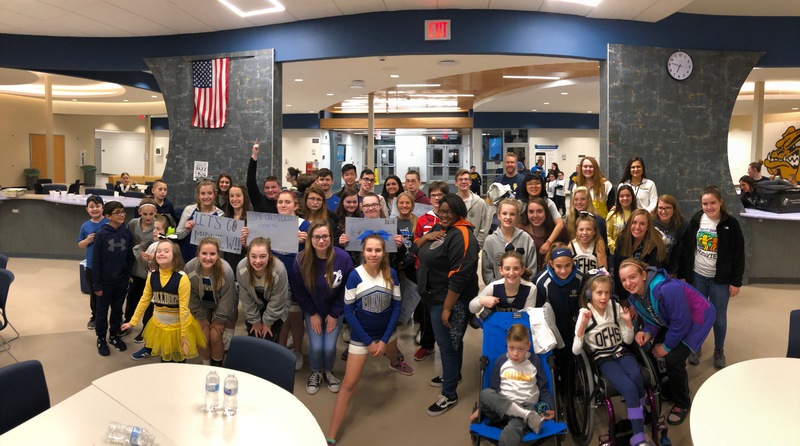 Olmsted Falls’ Helping Hands and Chick-fil-A sponsored the Basketball Social, with the latter donating sandwiches for both Midview’s Best Buddies and Olmsted Falls’ Helping Hands students. 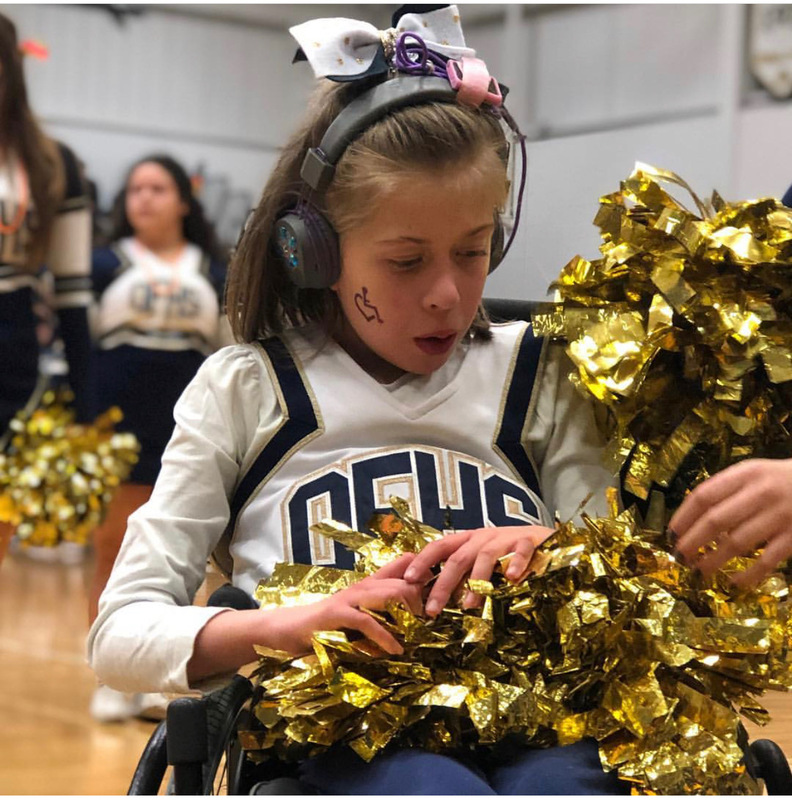 Both programs, which focus on acceptance and awareness for all, especially those who may have a disability or difference, joined for a fun social and hang out before the two basketball teams competed. Both head coaches, Chris DeLisio (OFHS) and Jim Brabenec (Midview) supported the event by having their teams warm up in the Celebrating Differences T-shirts and allowing students from Helping Hands to assist them warm up. Coach DeLisio made a surprise visit with his team during the social! Both Olmsted Falls and Midview cheer squads also participated in the event. 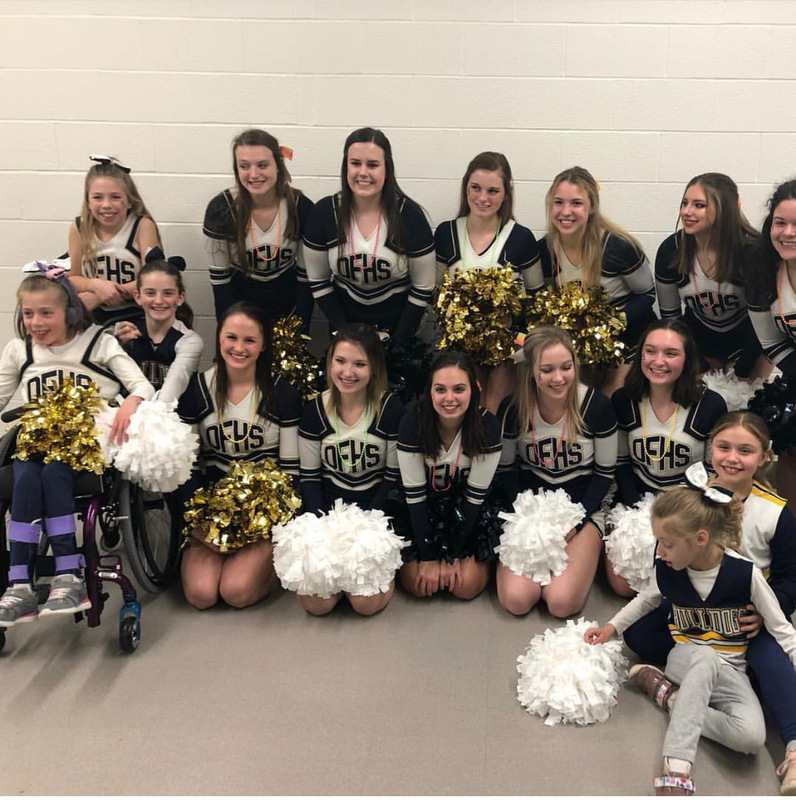 Midview brought its Sparkles team made up of cheerleaders and Best Buddies members and Olmsted Falls cheerleaders had Helping Hands members cheer with them. A special thanks to all who made it possible, especially the coaches and help from Liz Clearly’s Entrepreneurship class for planning the event and donations. Olmsted Falls City School District’s Annual Celebrating Differences Week took place the January 22-25 and was a great success thanks to the hard work of our Helping Hands groups across the district. To read local media coverage about this year’s OFCS Celebrating Differences Week, please click HERE. Kudos to all involved in the planning and to everyone across the district for their participation! Available in youth and adult sizes, Olmsted Falls Early Childhood Center has just launched its ECC “Paws to Be Kind” spiritwear fundraiser. Click HERE to visit the ECC Spiritwear store at Ryco Sports and view available styles. When ordering online select “Ship to ECC” or “Pickup at Local Store” options. Questions? Contact Renee Russell at rrussell@ofcs.net. 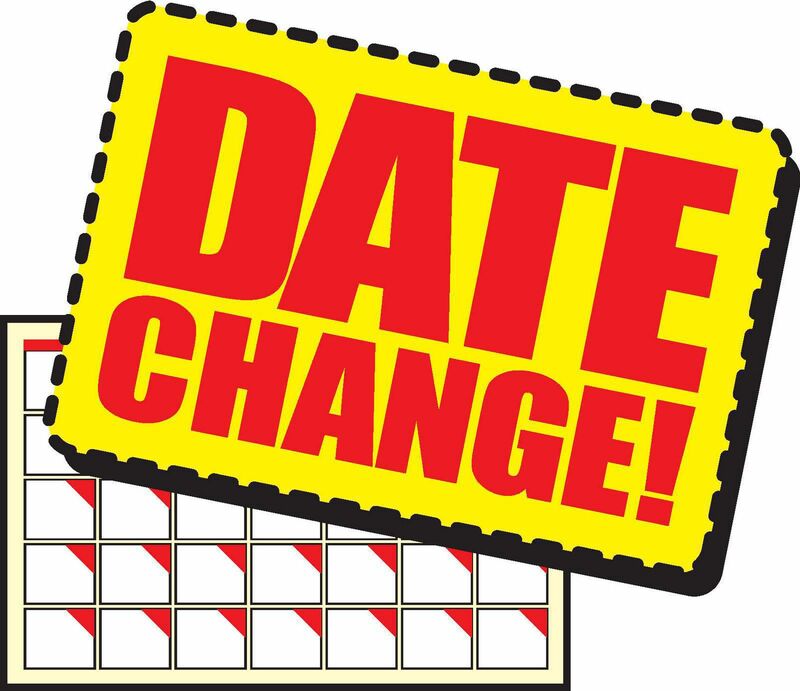 The Olmsted Falls High School Masquers and Forensics Patrons’ Cabaret Night has been changed from its original date of January 17th. The new date is Thursday, May 9th. Save the Date for May 9th! More information will be coming about this annual event. 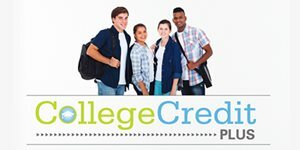 Students planning to take the placement exam for College Credit Plus should register for testing on the OFHS Counselor’s Corner Website – CCP tab. This test is specific to CCP courses at the high school and Lorain County Community College. There will be four testing dates, but spaces are limited. All testing will be held from 3-6 p.m. in room 606. Remaining testing dates include February 4th, February 11th and February 13th. Students who are unable to test at the high school are still able to test at the college. PSAT Information Sessions: Monday, February 4th, 6-7 p.m., OFHS auditorium – A counselor will be available for parents to discuss PSAT scores and next steps for 9-11th grade students who took the PSAT/9 and PSAT/NMSQT this past fall. 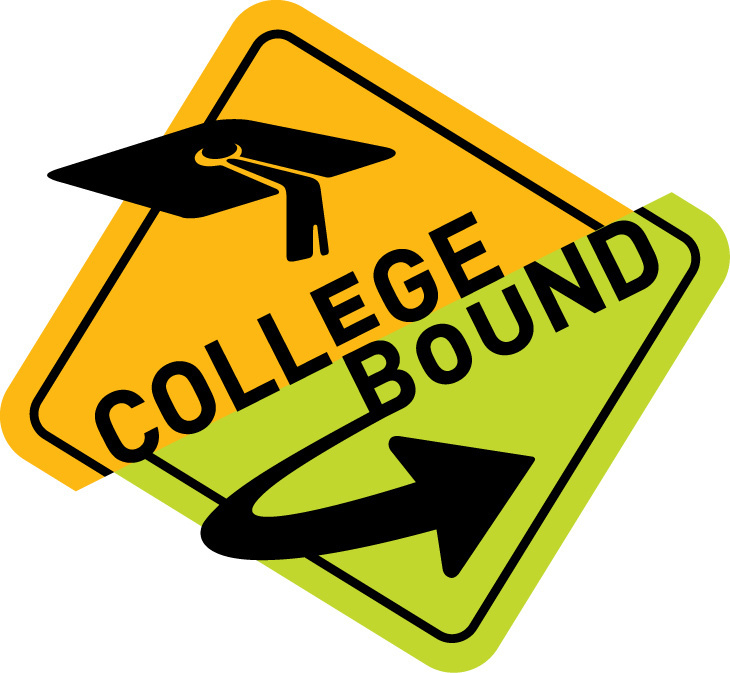 Please check out the Counselors’ Corner website for upcoming dates and important information. The website is available by clicking HERE. The students at Olmsted Falls Intermediate School participate in Makerspace, during which students rotate through a variety of stations. Some of the stations are robotic, some are digital and others are hands-on creativity stations. In order to keep our robotics and digital stations running, we are in need of old iPods and smartphones. If you have any old devices such as these, please consider donating them after you remove all locks and information from them. Donations may be dropped off at any school office. An experienced educator will be available to provide students with drop-in homework assistance for two hours after school, Monday through Thursday. Any students at the library after school from 3:30 to 5:30 can receive help from the Homework Mentor. Are you interested in joining our Bulldog team as a substitute teacher? Apply today at renhillgroup.com or contact Ann Stricklen in Human Resources if you have questions at 440.427.6015 or atricklen@ofcs.net. All are invited to the February 9th Alumni Las Vegas Night at the West Side Irish American Club. It runs from 7-11:30 p.m. Parents – 100% of the proceeds go toward scholarships for the OFHS Class of 2019 so why not come out and try your luck! Please come and support this worthy cause . . . you may even win CASH playing blackjack, let it ride, sideboards, dice or 50/50. Even if you don’t win, the money is going to a good cause. Hope to see you on February 9th. The cost is $5 at the door; 21 and older only at the event. Click HERE to see the flyer. All are invited to stop by North Ridgeville’s Chipotle eatery from 4-8 p.m. Monday, February 18th in honor of the Class of 2020. Bring in the flyer, which is available by clicking HERE, show it on your smartphone or tell the cashier you are supporting the cause because 33 percent of the proceeds will be donated to Olmsted Falls High School. Please note that online orders will not be included in the fundraiser. Hope to see you there. Chipotle is located at 32223 Lorain Road. The annual Olmsted Falls Athletic Booster Night at the Races is Saturday, April 6th, at St. Demetrios in Rocky River. For ticket information, please contact Brian Fritz at 216-337-4422. To purchase a horse, please contact Terry Atkins at terenceatkins22@gmail.com. In addition, the organization has a merchant letter to share. If you work for a company that makes donations to non-profit organizations, please present your employer the letter for a donation. The flyers listed below contains more precise details on this event. Simply click on each to view the flyer. Thank you in advance for supporting this organization at their annual event. Camp Invention® is returning to Olmsted Falls City School District! In partnership with the National Inventors Hall of Fame® (NIHF), Falls Lenox Primary School is pleased to offer the nationally acclaimed Camp Invention® program to children entering kindergarten through sixth grade. It’s an exciting, weeklong summer adventure with lessons that explore connections between science, technology, engineering and innovation. Children work together to create solutions to real-world problems and build critical 21st-century skills while rotating through several high-energy, hands-on modules. The week begins on June 24, 2019 with our own Brianna Smith serving as Director of the ALL-NEW 2019 program, Supercharged! Activities give participants the opportunity to explore, discover and achieve while having fun! Local educators facilitate program modules and enthusiastic high-school students serve as Leadership Interns, ensuring that one staff member is in place for every eight children. Register using promo code INNOVATE25L to save $25 (expires 3/22) or PLAY15LISTING to save $15 (expires 5/10) OFF $230. Every registration includes a complimentary Camp Invention t-shirt. Availability is limited, so visit www.invent.org/camp or call 800-968-4332 to secure your child’s spot today! Olmsted Community Preschool is having an open house THIS Wednesday, February 6, 2019, 6:30-8:00 pm. Registration for the 2019-2020 school year will open at this time. The preschool offers morning and afternoon classes for 3, 4, and 5 year olds. For more information, contact Melanie Reynolds, 440-235-3869 occpreschool@olmstedchurch.com The preschool is located at 7853 Main Street in Olmsted Falls. Registration is now open through March 15, 2019 for the Olmsted Community Summer League. OCSL offers baseball and slow-pitch softball leagues/games for boys and girls ages 4 through 18. We accept kids of all skill levels and require little to no travel. To register, visit the Olmsted Community Center website at www.olmstedcc.com or in person at the OCC on Mapleway Drive. Registrations after March 15, 2019 will incur a $20 late fee and will only be accepted until April 15, 2019. Please like OCSL on Facebook for frequent updates and news about our league. We look forward to seeing you on the ball fields. Any questions please contact the OCC at (440) 427-1599.